Important Update: This product has been discontinued by it's publisher. Back to all guitar courses. The Speed Learning Guitar System was created by Elmore Music, a music education company based out of Australia. Chris Elmore, the founder of Elmore Music is one of the main guitar instructors. 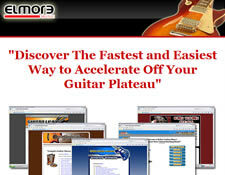 This online guitar course is actually an aggregation of Elmore Music’s 5 educational guitar courses. These include Guitar Tips (which we’ve previously reviewed), Guitar Leads, Guitar Theory, Guitar Backing Tracks, and Song Writing Secrets. The following review attempts to provide a brief synopsis of the various components of the Speed Learning Guitar System in terms of quality, usability, price, as well as other important aspects of the course. The Speed Learning Guitar System is available only as a downloadable product. In other words, you won’t receive anything in the mail. One positive aspect about digital products in general is that you usually receive access immediately. Each component of the course has a different website you’ll need to login to in order to see your lessons. Once you login, you’ll have the option to download each course to your home computer (PC or Mac).We found this was the most convenient way to view the lessons. Be forewarned though, that the entire course is a whopping 850MB of content. Personally, I think they could have done a little bit better job of compressing the course into a more manageable size. As Elmore Music’s products are html based, you use a web browser (Internet Explorer, Firefox, etc.) to view the lessons. Guitar Tips: We recently put up a full review of the Guitar Tips module here. Guitar Leads: This course follows up on Guitar Tips and is for the more advanced guitarist that want to learn to play lead guitar. Topics include learning the important pentatonic and diatonic scales, hammer-ons, string-bending, finger-tapping and other lead guitar tips and tricks. Examples are shown via tab notation. There is plenty of audio and video clips included (approx. 180 flash video files), but they are extremely short clips that only illustrate what playing a particular piece “looks like” (and not all that well, I might add). Frankly, we see no reason to get the Speed Learning Guitar System when you can get the excellent Learn & Master Guitar course for effectively the same price. Guitar Backing Tracks: This software was created for guitarists that want to quickly create some jam tracks to play along with. How it works is you select from a list of premade bass, drum, and synthesizer tracks to create your own jam-along mashup. Good idea… but poor execution. Usability is Guitar Backing Tracks’ downfall. For example, even though the prefab jam tracks were all recorded at the same tempo, we had an awful time trying to match the tracks so that they actually were on time and sounded like they were supposed to be together. Other problems include mediocre audio quality, limited audio controls, and poor organization. (Tracks are labeled Drum #1, Drum #2, Drum #3, etc.) In short, Guitar Backing Tracks isn’t worth your time. Guitar Theory: This module teaches aspiring musicians how to master guitar theory in all its complexities. You’ll learn all about notation, keys, scales, signatures, modes, intervals, and a lot more. These lessons are text-based with audio examples when necessary. Song Writing Secrets: This course is not specifically related to playing guitar, but many guitarists end up wanting to come up with their own songs, so this makes a nice addition. This is actually not an Elmore Music course, but actually a rebranded version of the Veterans Songwriting Secrets course. Song Writing Secrets mainly consists of songwriting articles and a 5-6 hours-long interview between some professional songwriters. Even though, a significant part of song-writing is inspiration as opposed to academic knowledge, there are still some really good techniques and ideas that you’ll discover within this course. Buyers Tip: If composing music is your thing, but you don’t want to buy the whole Speed Learning Guitar System to get this module, you can check it at songwritingtipsonline.com. Just a quick note about the multimedia content included in the above courses: Most of the video lessons were recorded at a low quality setting, and don’t contain much helpful information, and don’t have dual view, with the exception of some of the videos in Guitar Tips, which were very well produced. Elmore Music’s customer support options include email, phone, and fax. All Elmore Music Products accept credit cards and PayPal. The Speed Learning Guitar System comes with the security of a 2-month money-back guarantee. If you don’t think the course is worth what you spent on it, you can request a refund from their payment processor. Buyers Tip: Citing the current worldwide economic situation as their motivation, Elmore Music reduced prices on many on some of their guitar courses. The Speed Learning Guitar System’s price was lowered from $197 to $147. The individual course module’s prices were also reduced. Frankly, we see no reason to get the Speed Learning Guitar System when you can get the excellent Learn and Master Guitar course for effectively the same price. The Speed Learning Guitar System lacks strong visual aids in most of the learning material. We did however like the Guitar Tips module, as it had pretty decent production quality and good learning material for a pretty good price. Thankfully, Guitar Tips can be purchased on its own, so you don’t have to plunk down $150 bucks for a marginal guitar course. Disclaimer Notice: In the interest of full disclosure, we acknowledge that we accept review copies of all products we review and receive commission on some, but not all products we rate on this site. Please be assured that we do not let this interfere with our editorial process. As an independently-owned product review website, we take great pride in providing honest, accurate, and useful information about all products and services discussed in our reviews. We never have nor ever will accept paid reviews and strive to maintain an objective perspective at all times. Lastly, we have no personal interest in any of the products we review, nor are we owned by any company whose products appear on this site. Thanks for reading! ** Grey text indicates course is discontinued. Need guitar gear? Musician's Friend's got you covered with some of the lowest prices on the internet! Get your guitar gear from the biggest and best retailer of musical instruments worldwide! Get cash for your opinion! As a user of this course, let us know what you thought of it by writing a qualifying review and get yourself some cash! It's extremely easy to do! Find out how!